Not every crash pad that you find in the market meets your needs. And when you find one, you are sure to stick with the brand for a long time. A high-performing pad has quality foam, durable shell, and most importantly- save you from bigger falls. 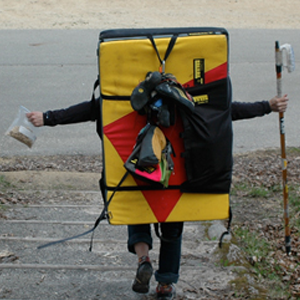 Organic Climbing has built Organic Full Pad which meets the needs of boulderers and climbers. This is why this product has become widely popular in the bouldering world. Here, we have reviewed the Organic Full Pad and noted down the goods and the bads of Organic Full Pad. Built with some of the best and long-lasting foams, the Organic Full Pad is something to watch for. The manufacturer in a small factory of Pennsylvania has put the quality materials, great sewing and workmanship on building this amazing pad. The pad has a unique and hard foam sandwiched between two layers of soft open-celled foam. It also uses a hybrid hinge design with a flat landing zone. The full Pad is 36” wide, 48” long, and 4’ thick. 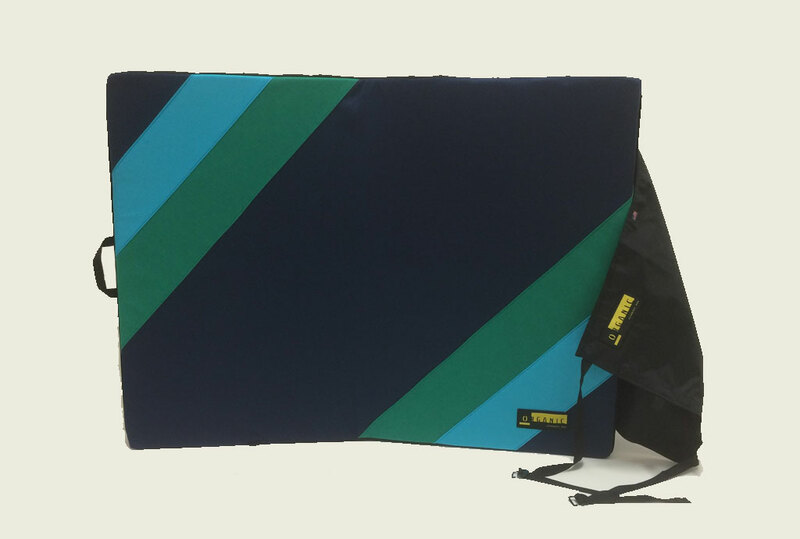 It is a great crash pad that you can use while bouldering and climbing. You can use it individually or with a half pad. This pad is significantly lighter than its counterpart Big Pad. So, you can easily carry it and navigate through forest or hours of walks. When To Buy Full Pad? The pad has neat and clean stitching with a simple design. The reinforced stitching on the pad is worth noticing. The manufacturer has used bullet-proof buckles and the superior outer layers on the exterior of the pads. Also, they use bright colors on the surface. Organic Full pad is somehow similar to the Organic Simple Pad. The difference between these two is Organic Full Pad has a closing flap that acts as an additional pocket. The pad has a reversible front pocket flap which you can use to hold the Half Pad, Briefcase Pad, or Blubber Pad. When you carry this pad individually, you can reverse the front pocket flap to cover the shoulder straps and waist belt. Those straps and belt when left exposed may entwine with random items or become dirty. Less or more, the external storage flap can keep your shoulder straps dry and clean in a wet or muddy area. This is also a highly useful feature that some other rival crash pads miss. When you want to size up from the regular category, but do not want a too massive pad, Full Pad is the perfect size for you. Full Pads are the standard design of pads in the climbing world. They are not as heavy and massive as Oversized pads. So, transferring them is quite a hassle. Also, oversized pads are pretty expensive as well. Open Size 36" x 48" x 4"
Folds Down To 36" x 24" x 8"
Organic climbing uses bright and unique design on its pads. The design of Organic Full Pad is simply great. You will not find any unnecessary add-ons or zips that adds on weight or get damaged while using the pad. The pad is well-stitched with a great finish. Its beautiful appearance makes it easily stand out from other pads. To be specific, a pad is all about foam. Organic Climbing uses the unique and one of the best foam out there to make Organic Full Pad stand out from rest others. They use memory foam, urethane rubber of high density, and open cell foam. The proper balance between softness and hardness makes sure you stay safe on bigger falls too. Unlike other pads, Organic Full Pads do not lose their shape even after years of abuse. These pads stay firm and well-shaped even after using them on the blocks for several seasons. This is all due to the quality of foam that Organic climbing has used to build this revolutionary piece. Organic Full Pad uses 1050d ballistic nylon and 1000d Cordura for the exterior shell of the landing zone. There are no other popular brands that use the US-manufactured Cordura ballistic nylon. With these highly durable materials, there is little to no chance of wear and tear even after years of use. How amazing this really is. You can describe Organic Full Pad as simple, strong, and beautiful. Since the pads are bulky pieces of gears, the carrying system plays a vital role. Organic Full Pad uses an adjustable and padded shoulder strap with chest and waist strap. The pad is quite comfortable to carry as it sits well on your back while carrying. With the load strap, you can carry two pads at once without using any extra straps. Besides, you also have the option to remove the shoulder strap. But, you usually do not need to remove them. Organic Climbing uses touch metal to build the hook-and-loop side buckles. The plastic waist and chest buckles are also pretty strong and very comfortable to use. All in all, Organic Full Pad has an excellent carrying system. To make such a durable pad, Organic Climbing has used the top-quality foam. So, the Organic Full Pads are slightly heavier as compared to most of the pads of their size. But, they are the pads that are pleasant to land on and are sure to last for a long, long time. They weigh about 12 lbs. This is a piece of good news for many climbers who worry about the parts being damaged. All the minor parts like chest buckles, waist buckles, shoulder strap, and other components of the pad are easily accessible at Organic Climbing. So, if any component of the pad gets damaged, you can easily replace those faulty parts. Not just that, with a small added fee, you can refill the open cell foam of your pads. So after years of use, when you feel the need to refill the foam, you can just contact Organic Climbing to refill your pad. Customers get the chance to determine the color and pattern they want to use in their crash pad. Since there are no retailers(except a few) of Organic Crash Pads, you have to directly order them from the manufacturer located in Pennsylvania. This not only reduces the price rate but also helps the manufacturers understand what their customers actually want. With some customization option, you can give your pad a unique look with the color and graphics you prefer. Moreover, if you throw a few more dollars, you can ask the manufacturer to add some features like extra pockets or some other functions. At $185, Organic Full Pad is a great deal. Since the manufacturer does not use a middle person or retailer, customers get more value. It could have been $250, or maybe more if there were middlemen. So, the quality of the pad not justifies the price rate but makes you feel the deal is a huge bargain. And not to forget, you can customize the look and design of your pad as per your preference. And you know, the customized products are usually more expensive than the ready-made ones. But, Organic Climbing has been able to keep the price as low as the price of other readymade pads in the market. Since the pad does not have a fabric to cover the bottom of the pad, it would be nice if it had one. You can keep the miscellaneous item there which you can access quickly. Also, we felt the pad would be better with pocket material a bit more textured like the pad cover. While we tried to double up the pad for a better landing, the pad at the top slid. So, Organic Climbing should have a thought on this issue. If you want to avoid the pocket flap, Organic Climbing also has the Simple Pad. Simple Pad is the streamlined form of Full Pad with no sewn pocket flap. We also heard some climbers saying these pads need a short break-in period to soften landings. Although we did not feel so, we thought this issue is still worth mentioning here. Besides these two, we did not find any downsides of this pad. Organic Full Pad is one of the greatest pad ever built for bouldering. With the simplicity in the mind, the manufacturer – Organic Climbing retracted from using the unwanted flashy features. So, Organic Full Pad has a simple and timeless design with only the must-have feature. 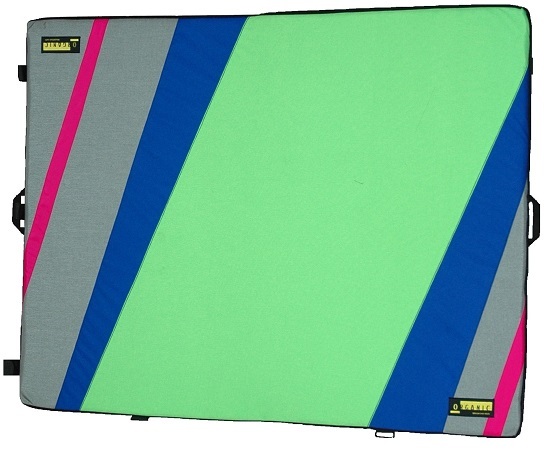 They have used the highest quality ingredients to build this highly durable crashing pad. Their hybrid hinge system ensures that foam does not wear prematurely from the fold crease. At just $185, Organic Full Pad is a bargain. And once you buy it and start using it, you are most likely to stick with this Pad for rest of your bouldering.